Dedicated September 28, 1997, by Archbishop Daniel M. Buechlein. 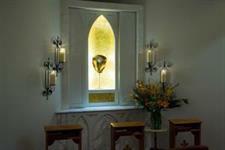 The Blessed Sacrament Chapel was established in thanksgiving for all our beloved priests. Eurcharist Adoration is available 24 hours a day, seven days a week, for visitors and those with committed hours. "The Most Holy Eucharist is the real and substantial Body, Blood, Soul and Divinty of Jesus Christ present under the appearances of bread and wine. After the Consecration of the Mass, only the physical characteristics of bread and wine remain; now the substance on the altar is Jesus Christ. Each particle of the Sacred Host and each drop of the Precious Blood contains the entire Jesus--the very same Messiah Who lived thirty-three years on earth and Who now lives risen and glorified in Paradise... Since the Redeemer, Who is God, is really present in the Holy Eucharist, the Blessed Sacrament deserves the same worship and adoration as that given to the Lord of the Universe." Show respect by bowing, genuflecting or kneeling on both knees upon entering and leaving the chapel. Sign your name in the Chapel Book to your left as you enter. It is your witness to your belief in Jesus' presence in the Blessed Sacrament. Please maintain a respectful silence, speaking only if necessary. If you must leave and no other adorer is present, please close the doors in front of the Monstrance. Would You Like To Commit To An Hour? Would you like to give Jesus one hour of the 168 hours He gives you each week? To commit to your special hour each week with Jesus, please call John or Sandra Behringer at 251-9731. The following hours have no committed adorer. Would you like to commit to one of these? If so please call John or Sandra at the number above. "Lord, thank you for helping me and my family make an important decision regarding a transfer offer. Lord Jesus, I place my trust in You." "Thank you Lord, for watching over our family at the time of Dad's death. Continue to guide us and fill our lives with Your work." "Last year about this time I prayed and prayed for my son and daughter-in-law who were having great difficulty. ...with your help they are together today and I feel I never thanked You for being with me even with my weak faith." "In gratefulness for lifting my depression..."
"Dear Jesus, I thank you for Your will, even if I don't understand it. Thank you for being my friend. I love You."